This month's Daring Cooks' challenge was to braise we had complete freedom to do any sort of braise we wanted. What a fun challenge and so much freedom and from the superb responses from the other forum members this challenge went down really well, so many braise using all sorts of ingredients such as chicken, duck, pork, beef short ribs, fennel, root vegetables, tofu even moose! See the PDF of the challenge recipes with hints and tips here. 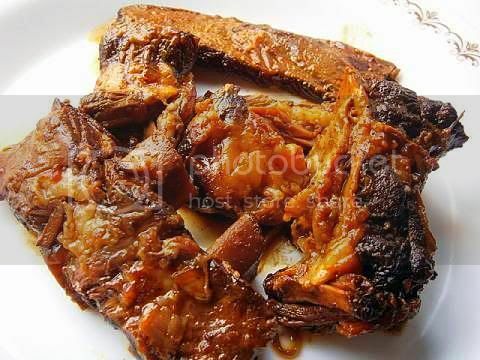 3. the braising causes the muscle fibers to absorb moisture from the cooking liquid and steam. Which gives you a juicy piece of meat. 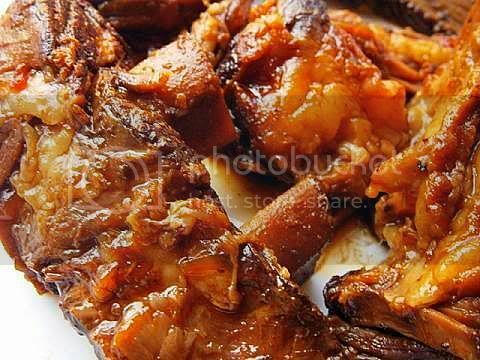 Braising also melds flavours from the stock, vegetables and any herbs and seasonings. 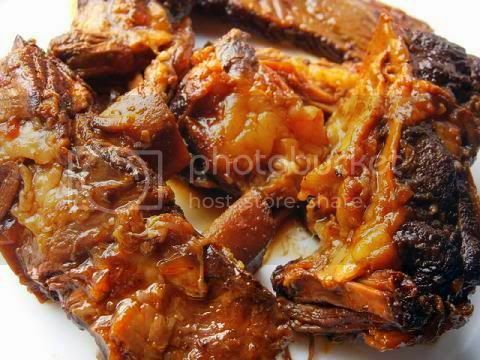 So it is important to pay attention to searing the meat correctly (including the bones), and the flavouring ingredients in the braising liquid. Take careful note of all the wonderful tips and hints that our lovely hostess Carol has included in the challenge write up they really do work. I like a longer slower braising time at the lowest temperature 140°F/60°C to cook meat safely I think it really adds a lot more flavour into the meat. 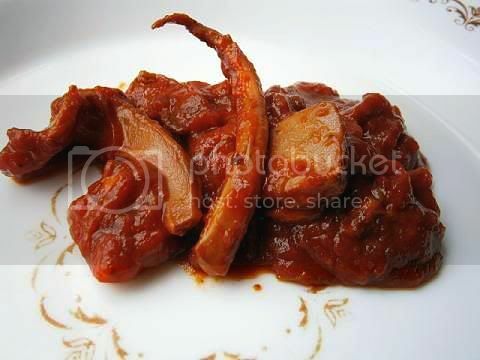 This recipe uses an initial eight hour marinade of fried tomato paste for acidity, onions and garlic which is cleaned off then the ribs are seared, and then they are braised for 14 hours at 140°F/60°C (in a cool oven) in a mixture of ironbark honey and aged balsamic vinegar, a little red wine, smoked paprika, chilli flakes, bay leaf, a mirepoix, lots of pepper and the marinade. I used two bush tomatoes (an Australia native herb that is a strongly flavoured of tomato and eggplant even one is enough to perfume a whole room!) in the braising broth also, I was very lucky and got 3 kgs (6.6 lbs) of short ribs for only $10 (they were on special in the Asian butcher shop usually $15/kg) which consisted of two enormous slabs of meat studded with ribs. After the ribs were cooked and cooled the fat is taken off and the sauce is reduced to a thick shiny sticky consistency it has a super concentrated flavour. 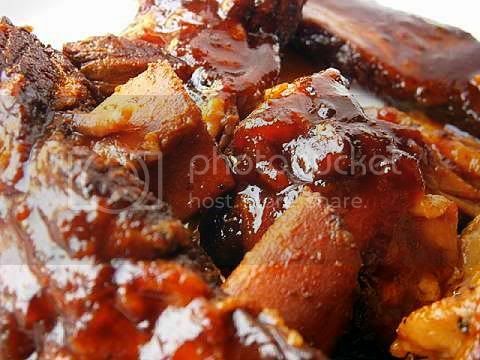 I was very impressed with the colour and flavour of the ribs a small amount of sauce goes a long long way in this recipe. Enough for many many meals I got almost 12 cups of braised meat and liquid. 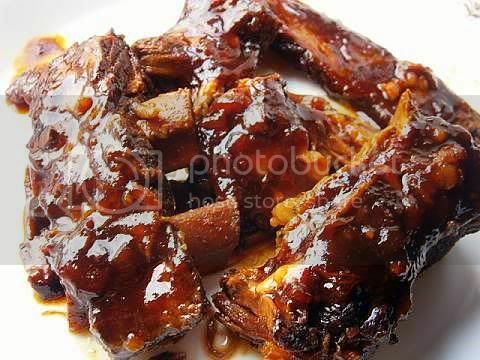 I will make a meal using the ribs in the next of couple of days since I want maximum flavour infused into the meat. Incidentally I got a new camera so that's the reason for all the close-up shots of the ribs I was experimenting it is an Aldi Traveller brand $56 point and shoot. 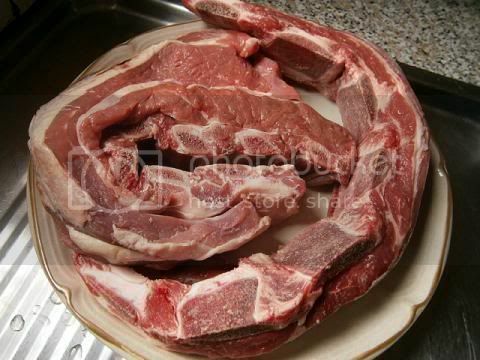 The butcher told me that oxtail will be on special soon maybe I will try that next, since all braises freeze well. The two humongous slabs of beef ribs they are about 1.5 kgs (3-1/3 lbs) each! I just had to do the caramel miso sauce it sounds so tasty, I got some duck pieces from my favourite gourmet butcher, I seared them to crisp up the duck skin and then oven braised them in the caramel miso sauce. 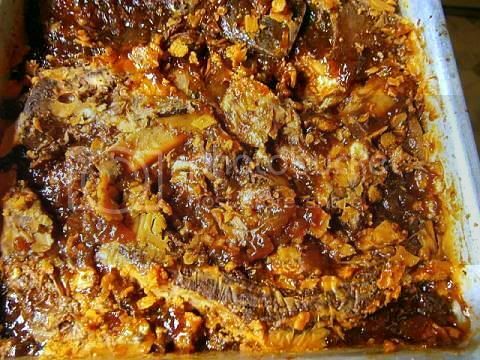 Then I rested the braised meat in the fridge overnight then I removed a voluminous amount of duck fat (almost 1-1/2 cups) and strained the braising liquid and reduced it until it was thick and shiny. I used my new chopper to cut the cold braised duck pieces into bite sized nibbles (I find it is much easier to cut cooked poultry when it is cold). I coated the nibbles with the reduced caramel miso sauce and broiled (grilled) them until well coloured. I don't make duck that often since most of my friends dislike it (bad experiences at restaurants, greasy and tasteless) even my friend Cherie liked these nibbles, not greasy at all. 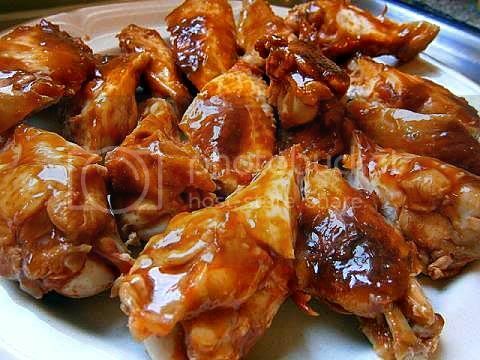 The caramel miso sauce is to-die-for and can be used for meat and veggies a great recipe. This is one of my favourite summer seafood dishes it is embarrassingly easy to make and it's a real crowd pleaser. 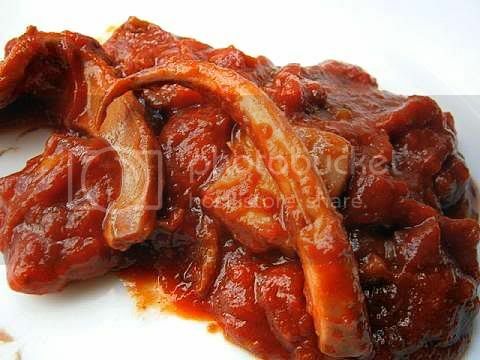 When squid is slow braised it becomes extra soft (melt in your mouth) and sweet and in combination with sweet chilli sauce and a tomato/onion based pasta sauce produces an unctuous amalgam that emphasises the taste of the squid. The squid sauce is sweet and mild and perfect as a sauce for a seafood pasta dish. I seared the squid pieces and braised them for six hours on the lowest simmer. 1. Clean the squid (remove the beak, the central clear cartilage, the fins, ink sack, the innards and scrap off most of the 'coloured' outer skin and scrap the tentacles to make sure that all of the sucker cartilage is removed). Cut the flesh into 2 cm (1 inch) pieces, cut the tentacles into 5 cm (2 inch) lengths. 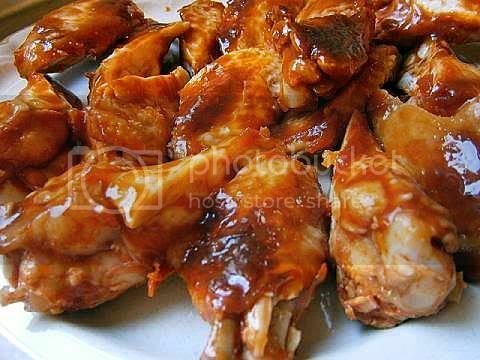 The pieces reduce in size by about 75% when braised so remember to cut the pieces much larger than the final cooked size. You can sear the pieces if you wish this adds a lot more flavour and colour to the pieces but increases the braising time by twice. Place the pieces into a medium stew pot. 2. Add the pasta sauce, the sweet chilli sauce and the optional garlic. 3. Slow braise uncovered in a very slow (90C/195F) oven or on the stove top just below a bare simmer for about 3 hours (check at 1 hour to see how much squid liquid is given off if there is a lot leave the pot uncovered, if the sauce is already thick cover the pot and add some water as needed during the braise) until the squid is soft to the tooth and the sauce has thicken and turned a brownish red colour, I have found you can simmer the sauce all day all that happens is the squid flesh becomes softer and softer and the sauce becomes more and more mellow. Makes 4 cups of squid pasta sauce suitable for about 8 servings. 4. The squid pasta sauce is much better the next day, store in the fridge up to 5 days. 5. Add fresh lime or lemon juice at the end of the cooking process to counter excessive sweetness if desired. Gremolata would be an excellent addition to the pasta dish. Notes:- try to get small-sized squid or baby octopus since their cooking time is about 2-3 hours, while one large (1-1/3 kg/3 lb) octopus can take 6+ hours! 1) You said searing increases the braising time...why? Do you have to the sear? Does the squid turn brown? 2) How do you serve it - pasta, polenta, by itself? Thank you so much for the kind kinds. 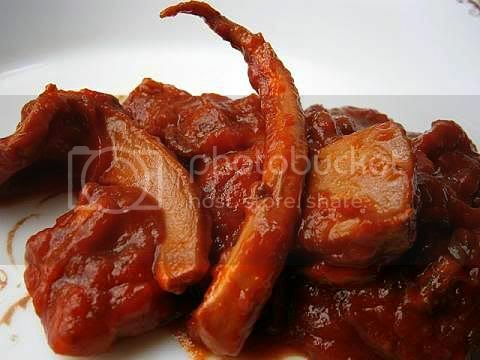 Yes squid/octopus is perfect for long slow braising unlike some other seafood. Answer 1) There are two ways to cook squid one) fast and furious in a fry pan or a BBQ or two) a long slow bare simmer. So if you sear the squid first basically it is cooked therefore if you braise it after searing you need a lot more time to make the squid tender again. No you do not need to sear I usually just throw in the freshly cleaned and cut squid pieces into the sweet chilli tomato/onion sauce and braised it just like that with no problems. For special occasions I like to sear the squid first since it adds an additional flavour dimension to the final sauce but there is no real need to sear first if you do not want to. 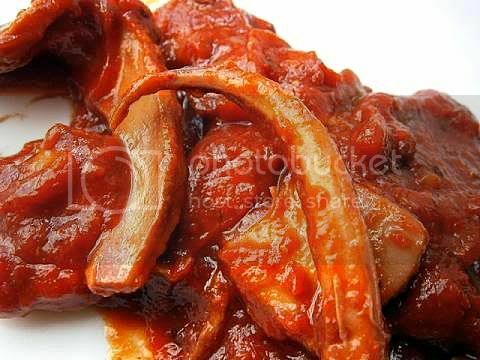 The sweet chilli tomato/onion sauce colours the squid flesh a light brown/red hue, if you sear first then the squid gets a very light brown colouring in addition to the brown/red hue that the sauce imparts to it. Answer 2) I just cook up some dry packet pasta and heat up some of the sauce and just add that to the pasta. 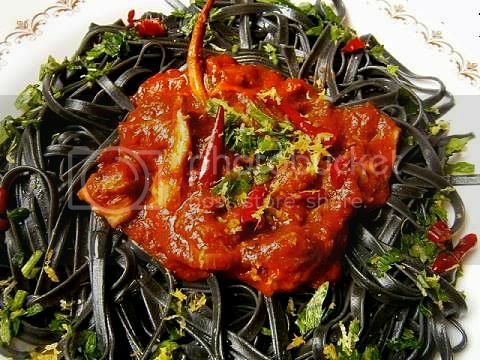 I like to use black squid ink pasta to show off the colour of the squid and sauce. I think polenta (or sweet potato gnocchi) would be wonderful with the squid sauce though I never have had it that way. The squid sauce is great on pizza as well especially if you add some extra seafood like oysters or clams etc to the topping. I had surprise lunch guests over so I thought that I would serve up the braised sweet chilli squid I made a few days ago I love this sauce since it takes no time to made up a restaurant quality dish (in appearance and flavour) literally 5 minutes. 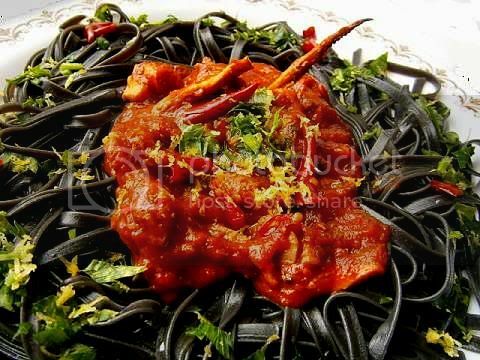 The use of squid ink pasta really adds a lovely base seafood flavour to the dish which enhances the braised squid sauce taste while the germolata adds a lovely "fresh" zing to the dish I never used germolata before now it is a must for me. 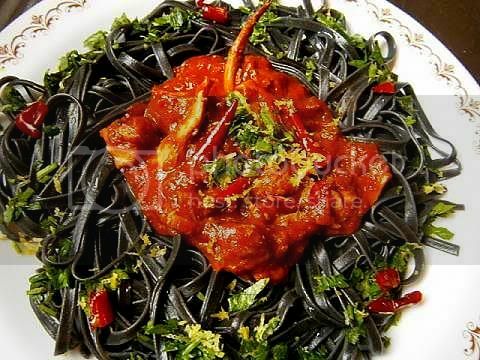 For this recipe I cooked some squid ink pasta (5 mins), made the gremolata (4 mins) while heating the sweet chilli squid (3 mins in the microwave) then finally I added some sliced marinated sweet chillies as a garnish. The final dish looks stunning the contrast of colours and textures makes its very visually appealing. This was a smashing dish I thought there is something about the texture contrast of the squid and the pasta that is delightful. And I have half of the sauce left! I liked this dish so much I'm having it for dinner tonight with some guests. Serve with crunchy bread and a green salad. I think you can see why this is my all-time favourite summer seafood pasta recipe, it's simple fast and always gives a spectacular looking result. A gremolata is a quickly made condiment used to finish savoury dishes with bright fresh citrus-herb flavours. In a mortar and pestle mash and pound all the ingredients until a paste is formed. Dab or sprinkle sparingly over the pasta. If you like you can make orange fennel gremolata replace the lemon zest with orange zest and replace the dill with fennel fronds. Instead of the shallot use fennel. I wanted to braise at least one non-meat ingredient for this challenge I just had to make a braised tofu recipe (I love tofu and am always looking for ways to enjoy it). I have been wanting to make sticky sweet tofu (tau hu kho) for a while now so this was the perfect challenge for this dish. And since I'm in love with germolata at the moment I made an Asian germolata to serve with the braised tofu it consisted of coriander, lime zest, garlic, Thai basil, mint, lemongrass, crispy fried chilli pawn (shrimp), salt and dark roasted sesame seed oil. I seared the sliced bite-sized firm tofu pieces until lightly brown then I braised them in a mixture of kacap manis, honey, rice wine vinegar, ginger powder, onion powder, chilli paste and vegetable stock. 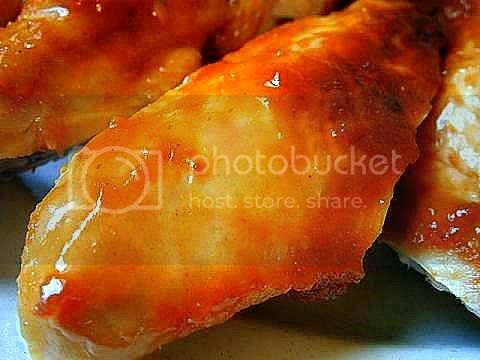 During the simmering the braising liquid reduces to a thick shiny sauce which coat the pieces with sticky sweet deliciousness. I really like this cooking method for tofu it adds so much flavour and colour to the bean curb. These taste great at room temperature great for dinner parties. 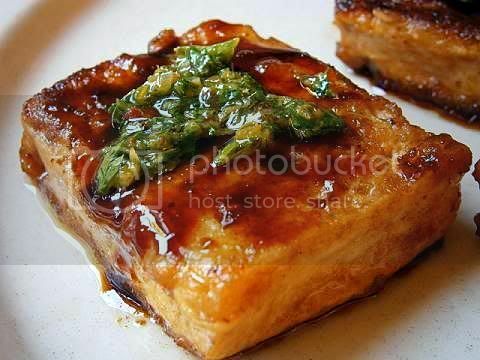 I just love how the bean curd absorbs the braising liquid and the sweet sticky coating is to die for, and I think the Asian germolata is a great addition to the original basic braised tofu. 1. 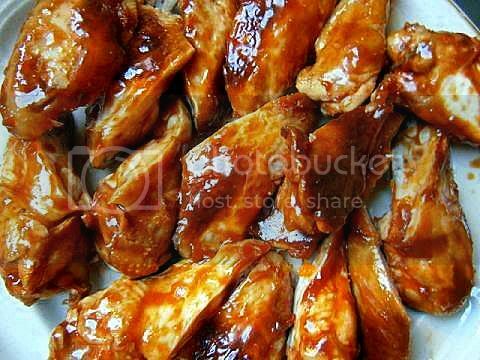 Combine all the braising ingredients in a small bowl mix well check for taste it should be slightly sweet with a salty sour after-taste adjust seasoning as needed, set aside. 2. 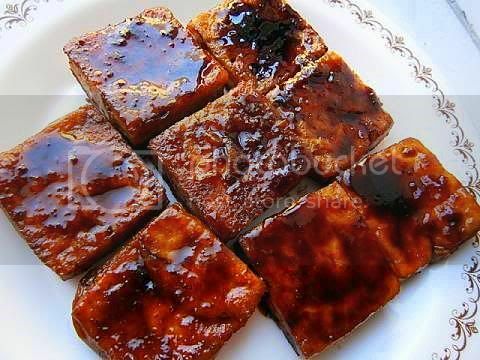 Drain tofu, slice into 1-1/2 inch (4 cm) square pieces about 1/2 inch (1-1/4 cm) thick, pat dry with paper towels. 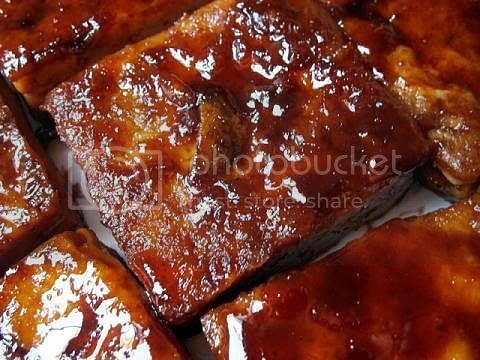 Squares work best for searing and braising. 3. Add oil to a frying pan heat on medium heat until the oil shimmers. 4. 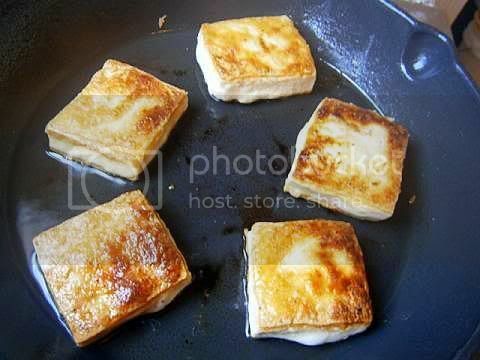 Fry the tofu until browned (about 3-5 minutes each side). 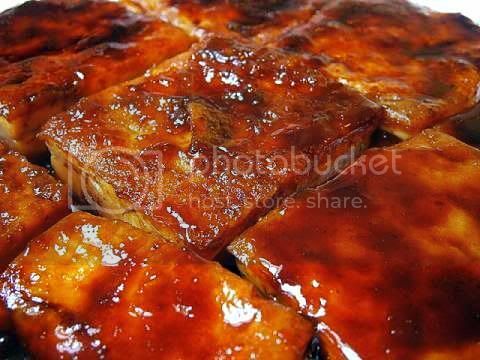 Do not overcrowd the frying pan, it is best to fry the tofu in small batches. Remove browned pieces set aside. Clean the fry pan if needed. 5. Add the braising liquid into the frying pan gently heat until barely simmering, add the browned tofu pieces in one layer braise (turning once or twice) until the pieces expand about 15% (about 30 minutes to one hour) and the braising liquid is thick and coats the tofu (add more water as needed). Check for sweetness add lemon juice as needed. Serve warm or at room temperature, braised tofu reheats wonderfully. It tastes even better the next day. Stores for 5 days in the fridge. In a mortar and pestle mash and pound all the ingredients while adding teaspoons of sesame oil until a paste is formed. Dab or sprinkle generously over the braised tofu pieces. As always Audax, your posts are a wealth of information. 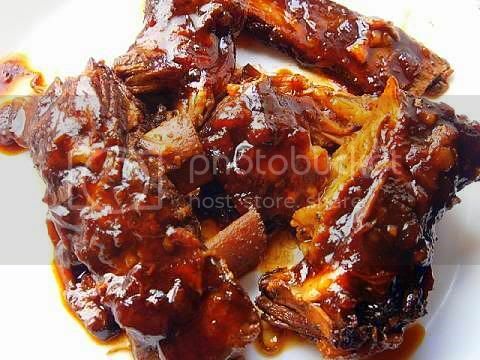 I loved all your variations but those ribs look so tempting and I can only imagine how good the balsamic and honey combination on them must have been. The tofu (and everything else) looks amazing! 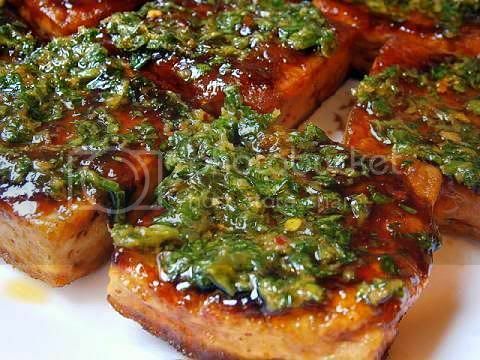 Braised tofu is quite a common chinese dish but we usually serve it with spinach. As ever, I'm really impressed with all the dishes you've made - a really interesting post too. Everything looks wonderful. I'm going to try the squid as it sounds delightful. So many inspiring dishes, Audax, your creativity is beyond words! All your dishes look and sound fantastic, and that last minute braised tofu must be out of this world! As always, you bring so much information and inspirations to all of us. Hats off to you!! Everything you made looks delicious, but especially your braised tofu. How imaginative to make an Asian gremolata! Wow - what great dishes! Braised tofu - who knew. I;'m going to have to try that one. Everything looks amazing, but those short ribs and tofu are really making me hungry! Wow! So many amazing Braises! Great job Audax!! Fantastic job as always! 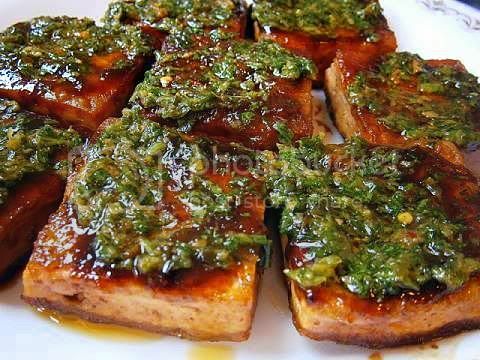 I cannot wait to make your braised tofu - it looks delicious and has all of my favorite flavors/ingredients! 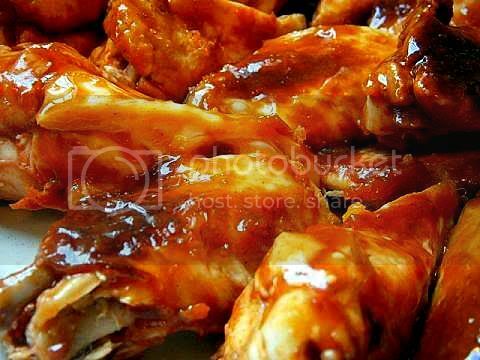 Everything looks finger licking good! My tummy is growling. I'm going to have to try your short ribs. Those look really tasty. Oh I can't decide which recipe I like the most - they all sound incredibly delicious! How do you find the time?! :-() You've really gone above and beyond. 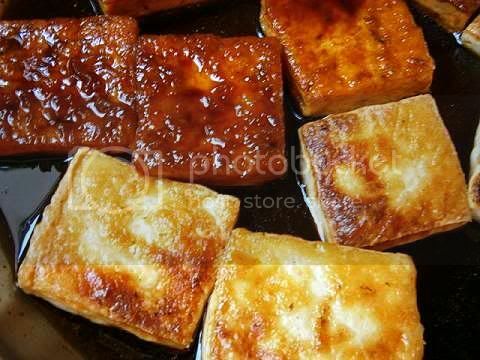 My partner is vegetarian and I was musing with the idea of braising tofu but must admit I was a little scared of the task..I thought that tofu would get overcooked and lose it's shape. 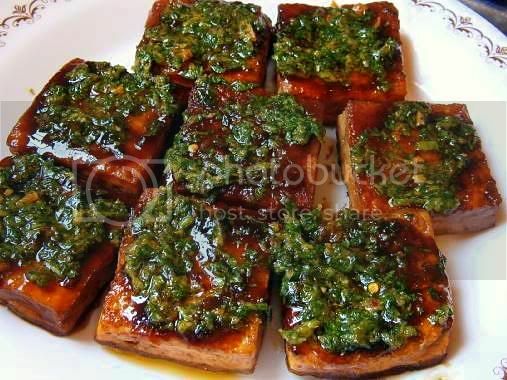 Reading and seeing your tofu braise with asian gremolata recipe has me all inspired now..I'll be raising that bean curd in the next couple of weeks. Audacious as ever! Wonderful results on them all. 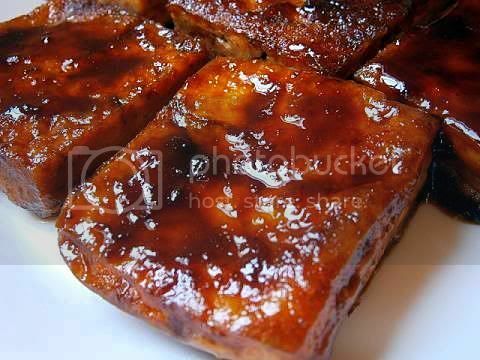 And, the Sticky Sweet Braised Tofu Steaks! A must try. Holy Moses! You are a force to be reckoned with and that double squid pasta is amazing!! Audax - thank you so much for all your help with this challenge! It was so much fun and your dishes truly pushed the envelop on how versatile braising is and served as an inspiration to us Daring Cooks. Audax, as usual you've done a phenomenal job with the challenge. Your duck nibbles are what inspired us to try that caramel miso sauce and I am SO glad we did! The ribs, the squid, the tofu - it all looks really wonderful. Red Meat always comes to mind when I think "braise", but your beautiful braised tofu could point me in an entirely new direction. 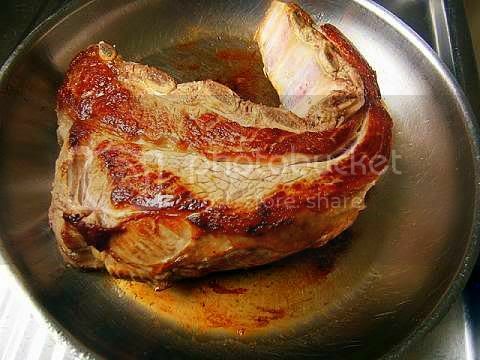 Thanks for sharing the lengthy, informative post of your many braising efforts. Ohhhh, that'll teach me to read food blogs late at night. I'll be dreaming about caramel miso duck nibbles tonight. (Hungry now!) All your dishes look beautiful. 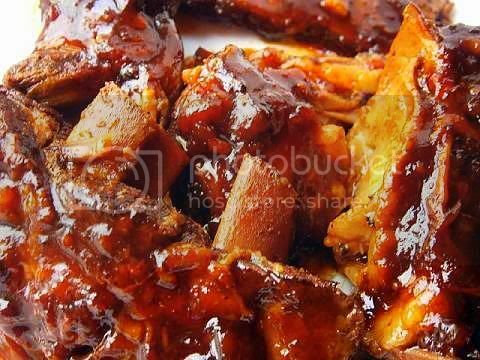 The ribs, duck and tofu all look so fantastic! I may be braising quite a lot soon! What more can I say...it looks yum yum yum! I can't stop looking at all the 'glazey' photos, everything looks scrumptious. The squid and caramel miso duck have me drooling. Wish I had been able to squeeze this one in. Beautifully done, Aud! Once again you've out done yourself. Amazing look dishes this month. I fell in love with the germolata too. The squid pasta look phenomenal-- I have to imagine that you end up getting surprise guests for lunch a lot if that's what is served! The tofu also looks delicious. I was peeking at your sneak peeks leading up to the reveal day and you made me feel so intimidated and inspired! We've never tried duck but I think your nibbles now have a place on our 'I'd like to try this' list! So much information in your post!